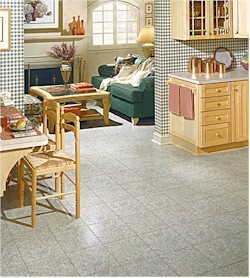 Tarkett brings to its customers more than a century of product innovation and design excellence. Through its predecessor companies, one dating back to 1886, Tarkett has long been a pioneer in both the residential and commercial segments of the flooring industry, developing many of the manufacturing techniques that are still in use today. Now part of The Domco Tarkett Group, Tarkett uses some of the most sophisticated technologies available to produce a broad range of sheet, floor tile and laminate products that meet the styling and installation needs of a diverse customer base. Tarkett’s residential sheet, floor tile and laminate products recreate a broad range of natural materials-slates, marbles, saltillo and ceramic tiles and woodgrains-that today’s consumers prefer. The Nature’s Touch™ embossing technique, available on select products, lends a realistic surface texture. A sophisticated palette of new neutrals complement every interior design style. With tough, easy-care wearlayers and advanced constructions, these floors stand-up beautifully to the day-to-day demands of the busiest households. Commercial sheet and floor tile products are distinguished by the ColorWorks® system, a collection of floors that feature the same sophisticated, yet complementary color foundations. This means that architects and designers can mix and match virtually any floor within the system to create one-of-a-kind designs within an interior. No matter the design, installation or performance need-from education to healthcare to retail and beyond-there’s a Tarkett commercial floor for every situation.